Question: What do you mean by “circuit”, anyway? I’ve mentioned rail circuits in a number of posts but I’ve never really explained them. So that’s what this post is for. 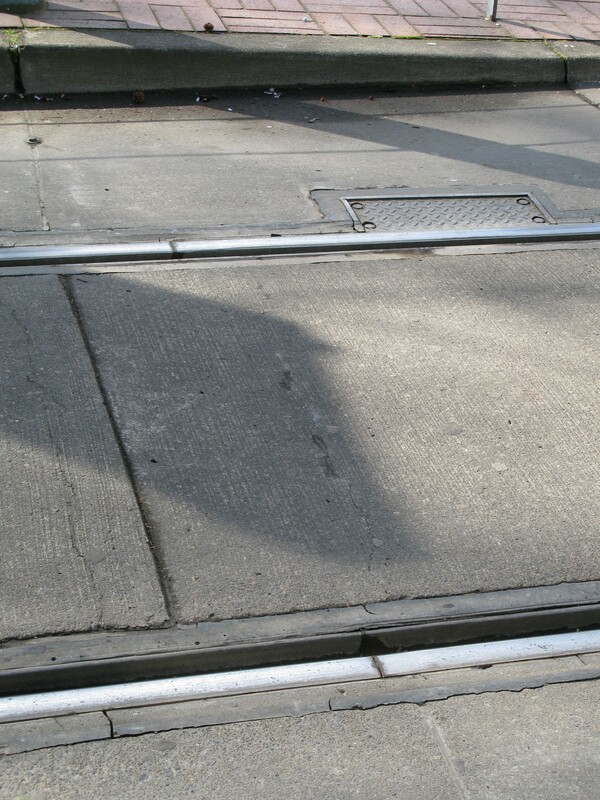 The rails are actually electric circuits – there is an electric current passing through the rails on all parts of the alignment. The voltage is low (15-25 volts) so it’s not harmful, but it’s just one of those “best practices” to not step directly on a rail. I’ve never heard of a person getting shocked by them, though there have been problems in the past of service dogs (see attachments 3 & 4 for TriMet specific examples) being shocked when stepping on the rails, particularly in wet conditions. As far as I know, that problem has been resolved and hasn’t happened in years. 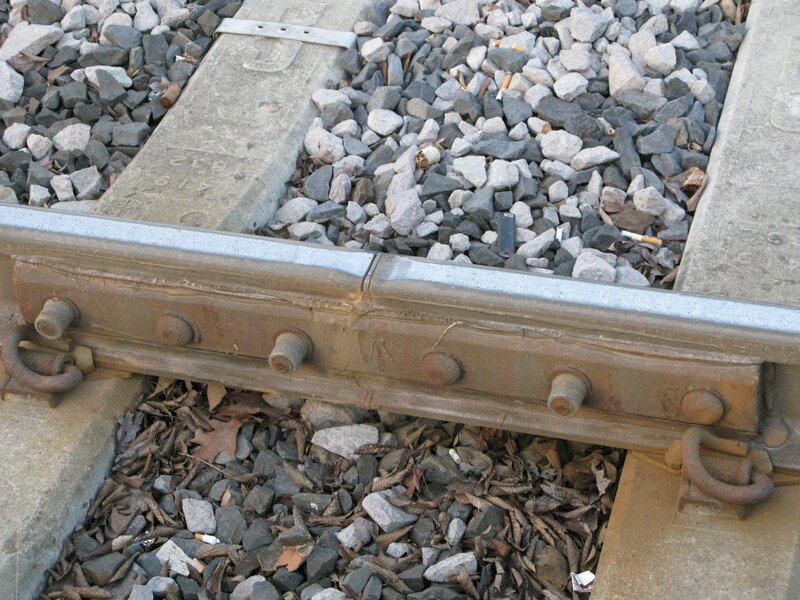 The boundary between two circuits in the track is called the insulated joint. You won’t see these from the train, but you can feel/hear them as the train passes over them. Insulated joint. I forget where specifically this was taken. I don’t have any video that I’ve taken myself which provide good audible examples of what it sounds like when a train is going over the insulated joints. Luckily, other Youtube videos provide. I’m shamelessly borrowing these examples – I did not shoot the video in either and take no credit for them. Train at Old Town/Chinatown, video taken from outside the train (link should take you to the right spot at the video, but if not, move the seeker to about 7:11). What you’re listening for is that short sort of skipping sound made as the wheels pass over the joint. On the external example, you can hear it as each of the three wheel trucks on both cars passes over the joints (sounds like 6 sets of 4 clicks); inside the train only one truck is clearly audible. 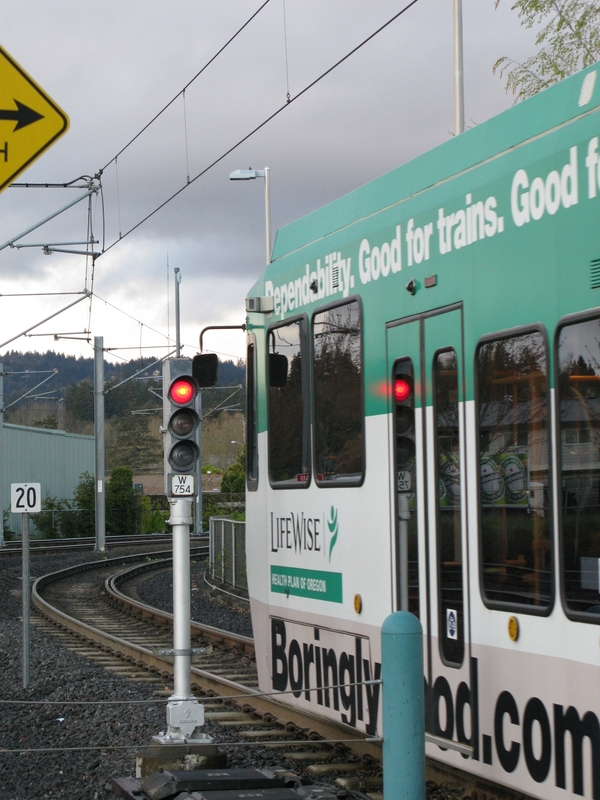 The basic “how it works” principle is that the wheel axles of a train shunt the circuit in the rails, thus detecting the presence of a train in that particular circuit. 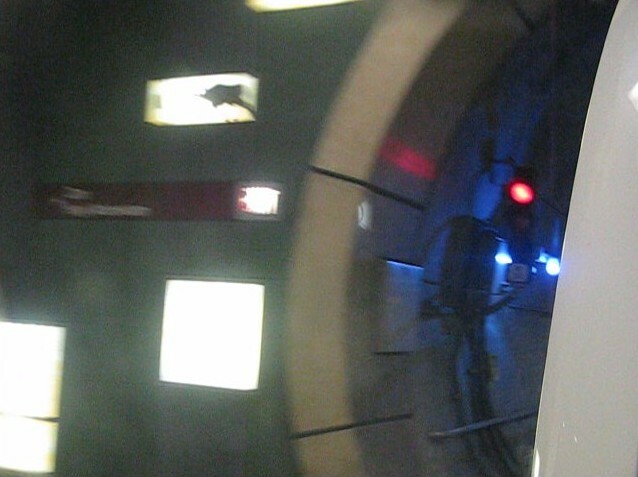 As the train moves along the alignment, it passes over the insulated joints from one circuit to the next, which indicates what sections of the track are occupied by a train. As you might have guessed, insulated joints and track circuits are directly related to ABS signals. Train movement in the diagram is from left to right. To review, if you’re in ABS territory and you have a green, that means you’re clear for two ABS blocks, or the distance between the next two ABS signals. A yellow tells you that the block ahead of you is open, but there’s a train in the block in front of that. And if you get up to the next ABS signal and it’s red, that means the train in the block in front of you hasn’t left yet. So how do the signals “know” that there’s a train there? 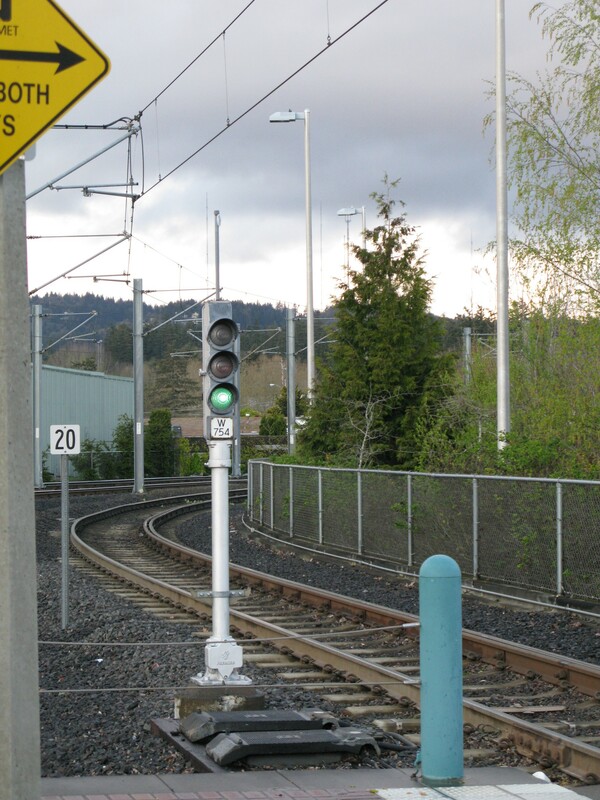 If a shunt is detected in the rail – meaning that something is going across both rails closing the circuit (namely the wheel axles of the train), the signal displays an aspect that indicates that the circuit is occupied – a red if it’s the circuit immediately after that signal, or a yellow if it’s not the circuit immediately after the signal but the circuit after the next signal. So when you have a red ABS signal, that means a train is shunting the circuit after that signal and that section of track is occupied. 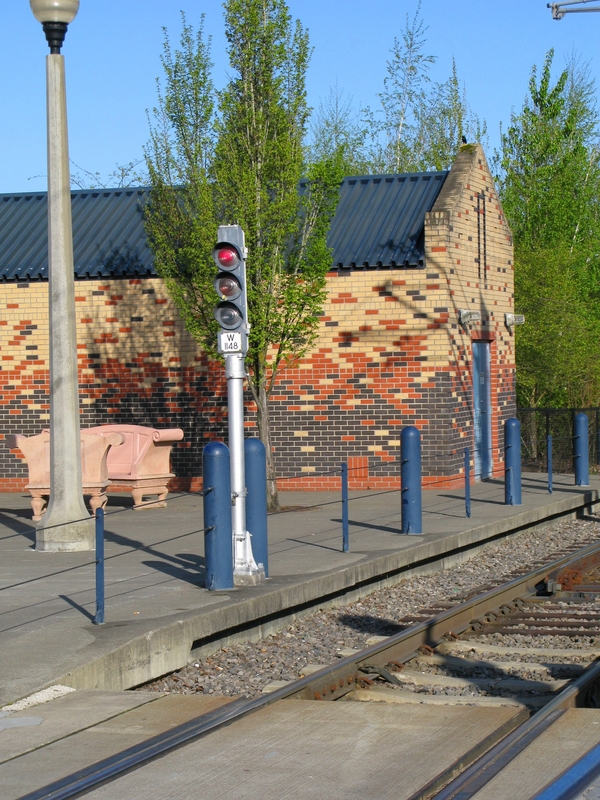 Once that train ahead of you passes the next ABS signal, which will have an insulated joint associated with it, it leaves that circuit and the signal that you’re waiting at will display a permissive aspect. This indicates that the block in front of you is now open. The signal becomes red, because now there is a train occupying the circuit. To conserve power, this particular signal will go dark once the circuit at the platform is no longer shunted, but if another train comes into the platform before this train passes the next ABS signal, W754 will display a red aspect again. A blurry picture, but it was taken from the trailing parlor cab of a Type 4 – so the three wheel trucks of the leading car have already shunted the circuit after the signal, making it appear red for the rest of the train.